Great Z's: Are Comfort Animals A Patient's Best Friend? We have a pretty strict visitation policy at our hospital--no minor children are allowed in Preop Holding or Recovery Room. The reasons are pretty logical. First of all, it can be frightening for small children to be around sick patients. They may be scared by the sight of blood or hearing loud moaning and even screaming coming from uncomfortable patients. Plus there's always the possibility of the children coming in contact with a contagious patient. However the rules don't apply to people's pets, or euphemistically called comfort animals. I had a patient who asked to see her young children in Preop prior to her operation. The nurse told her the rules and denied the request. However when the same patient asked to have her comfort animal brought in, it was no problem at all. They let the small dog into the room and even let it sit in the gurney with the owner. We were told that it is against the Americans with Disabilities Act to deny this request. Pushing the boundaries further, the patient then asked to bring the dog into the procedure room while she was having her procedure. The surgeon was too cowed to say no. I was flabbergasted. So a person's own children are not allowed to see their parents one last time before an operation but animals don't face the same restrictions? Instead of the owners' own selfish reasons for bringing their animals to the hospital in the first place, maybe they should be more considerate of other people. Comfort animals can be unruly, especially ones who are not actual well trained service animals but are really pets with ill fitting vests. Some people have allergies to pet dander. We are very aware of a patient's food and drug allergies but somehow it is okay to allow animals into a hospital setting. This is apparently a worsening problem for businesses everywhere. Comfort animals are being brought onto airplanes and into stores under the guise of being service animals. Most people are too polite to say anything even if the presence of the animal makes them feel intimidated or simply annoyed. So what was the solution to our Preop drama? We had our own pitbull at the ready. The charge nurse intervened and very clearly and emphatically told the patient that she was not allowed to bring the dog into the procedure room. Despite a weak protest, the nurse held her ground and the issue was resolved. That nurse deserved every dollar of her salary that day. I have worked with French Poodle nurses as well as the Pit Bull variety. For some reason, the Pit Bull nurses are attracted to the OR. Dogs are repelled by high pitched noises. The next time a nut wants to bring a dog in for a procedure, turn your suction on high and wave that Yankauer tip in the beast's face. On second thought, maybe the pet owner, excuse me it should be dog caretaker in today's vernacular, would be a more suitable target. 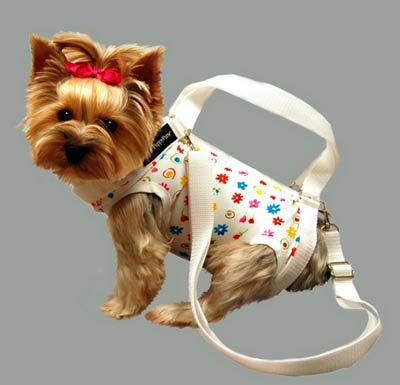 Maybe they should have placed a restraining device similar to what the canine is wearing on the patient.